This is an iconic song from the Oriel tradition. It was written and, probably, composed to an original air by Peadar Ó Doirnín (c.1700-69) who was a master of love poetry and a harper. This version of the song, with the air composed in 1907 by Peadar Ó Dubhda, was the only one of the poet’s songs to have survived in the recent oral tradition. Composer Seán Ó Riada revived and recorded another of Ó Doirnín’s songs: Uilleagán Dubh Ó (AHU pp.238-40) for the poet’s bicentenary celebrations in 1969 in the Gaeity Theatre Dublin. The song Séamus Mac Murfaidh (AHU pp.241-46), which is sometimes attributed to Ó Doirnín, was popular with traditional singers. A number of his songs had survived in the local tradition while Irish was spoken as a community language. It belongs to a genre of pastoral, literary love poems and is a lyrical invitation to the land of milk and honey. It was more than likely that this song was sung to harp accompaniment, as were other songs of Ó Doirnín. At least three were included in the Bunting collection. 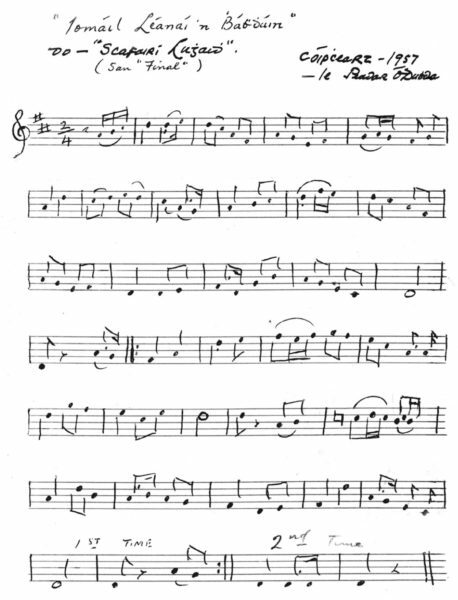 A version of the original air survived in the harp tradition and was collected and published by Edward Bunting and later published in the Journal of the Irish Folk Song Society 26 (ed. 1967) entitled A Phlúr na Maighdion. Úrchnoc Chéin Mhic Cáinte (now Killen Hill) was a spectacular ancient site and has great significance in the mythological and folk history of Oriel. Cian was the father of Lugh who gave his name to Co. Lú, Co. Louth. It was also the site of school of poetry and harp in the late 17th and early 18th centuries under the guidance of poet and harper, Pádraig Mac Giolla Fhiondáin. (AHU pp.343-7), which Peadar Ó Doirnín probably attended (AHU pp.348-50). 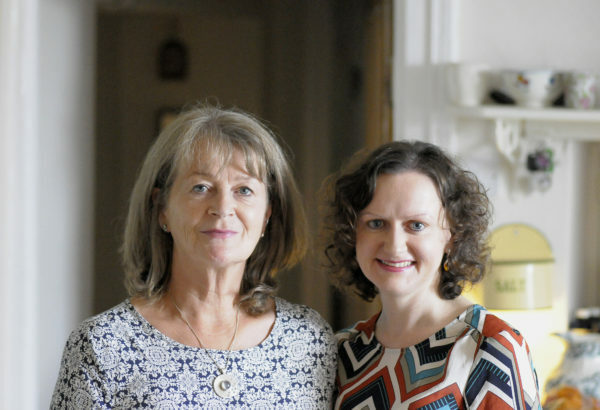 Máire Ní Choilm was invited to choose a song of her liking from A Hidden Ulster to include in her repertoire. Being familiar with Úr Chnoc Chéin Mhic Cáinte, having heard it sung by singers in Rann na Feirste, she chose the popular Peadar Ó Dubhda version of the air here. It has survived in the oral tradition since he submitted it for the Oireachtas competition in 1907. It is not the original air, however. An air entitled A Phlúr na Maighdion which was probably the original air composed by the poet Peadar Ó Doirnín, was collected by Edward Bunting in 1792 and was reprinted in A Hidden Ulster p. 236. San dún sin Chéin Mhic Cáinte. Ón dún sin Chéin Mhic Cáinte. Le hÚr Chnoc Chéin Mhic Cáinte. In that fort of Cian son of Cáinte. In the fort of Cian son of Cáinte. As the hill of Cian son of Cáinte. 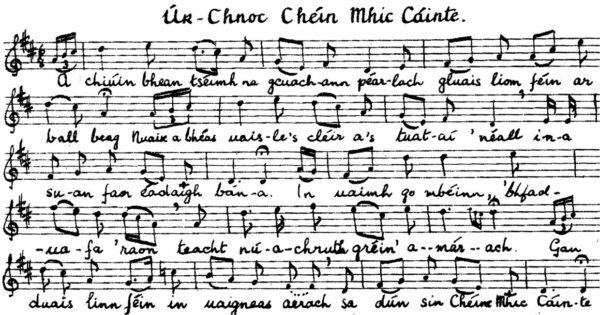 The air, which is sung here on video by Máire Ní Choilm, was arranged by Peadar Ó Dubhda (AHU pp.370-2) and is based on the air of a local Omeath song Iomáíl Léanaí an Bhábhdhúi. It won an Oireachtas award for him in 1907 as a newly composed air but it was a variant of an Omeath air. A version of the original air was collected by Edward Bunting and published in his 1809, Ancient Music of Ireland under the title of A Phlúr na Maighdion, which is the first line of the song (more pp 228-37). It is a much admired song in the oral tradition due to the skill of both Peadar Ó Doirnín and Peadar Ó Dubhda.